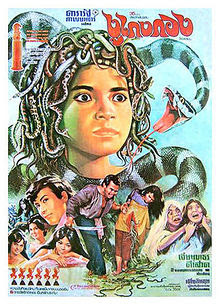 I remember one of the biggest box-office hits in Southeast Asia, The Snake Man (inset). I had thought the movie which in 1972, won 6 golden awards at the 19th Asian Movie Awards in Singapore was a Thai movie but it was actually Cambodian and in fact, had for decades been considered a Khmer Classic. The Snake Man also known as The Snake King's Wife is actually based on a Cambodian myth about the relationship between a snake and a woman. The director, surprising too was a Chinese. Tea Lim Koun did not just won the Best Director award but he had been recognised even today as the father of Khmer Cinema. It is not always that Chinese in South East Asian countries are feted for their contributions. Have a sneak preview of this Cambodian hit!